Gite La Colline comfortably sleeps 5 and is the largest of three luxury gites forming part of Barès, a traditional farmhouse in the beautiful Haute Garonne département in the Midi-Pyrénées. Completely self-contained, the gite has ancient beams, wood-burning stove, its own private garden and terrace and stunning views of the Pyrenees, shared use of the luxury 10 X 5m swimming pool and 1.5 hectares of grounds. Only 50 mins from Toulouse, an hour to the Pyrenees and 75 mins to the nearest skiing. Fully equipped with two double bedrooms (one with patio doors onto the private terrace) and a single bed on the mezzanine above the beautiful beamed sitting room, the gite has wi-fi, satellite TV with French, English and most major European language TV stations, DVD player and selection of DVDs, its own terrace and garden within the beautiful grounds of Barès. The sitting room is the oldest part of Barès, containing the fireplace and bread oven of the original farmhouse kitchen. In Winter the wood burning stove brings the fireplace to life and creates a wonderful Winter hideaway. The beds will be made up ready for your arrival and there will be plenty of towels. In the kitchen you'll find all the essentials such as tea, coffee, sugar, salt and pepper as well as fresh bread, croissants, milk, butter, jam, ham, cheese and a bottle of wine. With a gas hob, microwave oven, fridge and dishwasher, pots and pans, crockery and glassware, you'll have everything you need to cook up a feast, although for Summer breaks you might prefer to use the barbecue provided on the terrace or picnic by the pool. Barès really is in the heart of the countryside, so you will need a car. The pretty market town of L'Isle en Dodon is a scenic 12 kilometer drive and has a large supermarket, shops, cafes and a Saturday morning market. We are Jenny and Gerry Czerniawski and we are excited to be the new owners of this beautiful traditional farmhouse. 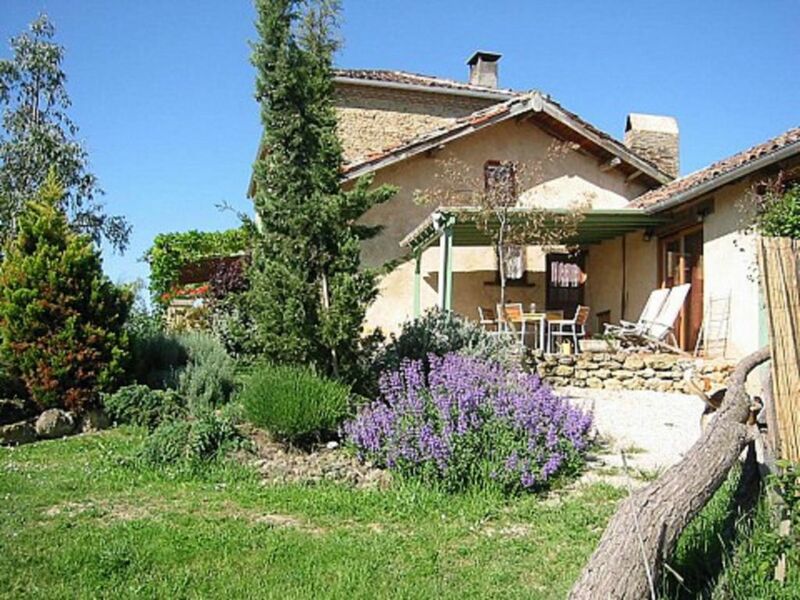 This is a very special part of France and for us it was love at first sight when we first saw this house, its wonderful land and its stunning views of the surrounding countryside and mountains. It is the perfect place to escape from our busy jobs in London. If you come here and we are not around there will always be someone here to welcome you and to make sure everything is ready for your stay. We welcome guests of all nationalities and between us we speak French, German, a little Italian, a little Spanish and even a little Korean. Fully equipped and sleeping up to five people comfortably with two double bedrooms and a single bed on the mezzanine above the beautiful beamed sitting room, the apartment has wi-fi, satellite TV with French, English and most major European language TV stations, DVD player and selection of DVDs, its own terrace and garden within the beautiful grounds of Barès. The sitting room is the oldest part of Barès, containing the fireplace and bread oven of the original farmhouse kitchen. In Winter the wood burning stove brings the fireplace to life and creates a wonderful Winter hideaway. The beds will be made up ready for your arrival and there will be plenty of towels. In the kitchen you'll find all the essentials such as tea, coffee, sugar, salt and pepper as well as fresh bread, croissants, milk, butter, jam, ham, cheese and a bottle of wine. With a gas hob, microwave oven, fridge and dishwasher, pots and pans, crockery and glassware, you'll have everything you need to cook up a feast, although for Summer breaks you might prefer to use the barbecue provided on the terrace or picnic by the pool. At Barès you will find yourself in the heart of a stunningly beautiful, rural, farming community, unspoilt by tourism. It is a 10 minute drive to the pretty market town of L'Isle-en-Dodon where the nearest shops can be found, including a large well-stocked supermarket and a vibrant Saturday market. For a taste of the local cuisine and culture, head to Chez Jeanne La Fermière on Sunday lunchtime, or to Le Comptoir after the Saturday market in L'Isle-en-Dodon. For nightlife we recommend stargazing whilst listening to the frogs and nightingales in Spring and the crickets in Summer! A very spacious and fully equipped bathroom and shower with lots of towels and a washing machine. The bikes have been serviced and are available for our guests. They are all of varying ages but include two small bikes for children. A brand new 10x5 pool has been beautifully landscaped into the grounds of the Farmhouse and serves the three gites. Great location . Perfect for exploring but just as good for a quiet getaway . The Gité had absolutely everything you could want and more. An fantastic place to go with family and friends but it would be equally good for a couple by themselves. The hosts are just wonderful catering for your every need as well as giving great suggests for local restaurants and places to visit. Will definitely be coming back . Thank you so much for this lovely review. We’re so glad you enjoyed your stay at Barès and loved the gîte. We look forward to welcoming you again one day. We had a lovely holiday and very much enjoyed our stay. The gite was very clean and there was a useful welcome pack when we arrived. The garden is quite private. The views are amazing with rolling countryside all around. The pool is of a high standard again with amazing views all around. There are plenty of inflatables to use in the pool. There is plenty to do and we enjoyed playing badminton, table tennis and the odd game of darts. The kitchen was a little small when cooking for 4 people but we managed and always ate outside anyway. Jenny and Gerry were very helpful and responsive when we had a few questions. We had a great time staying at Bares. The location was lovely with glorious views of the Pyrenees most days!! The new swimming pool is great and sitting by it had wonderful sunflowers all around. The gite itself was extremely well fitted out with everything you could need. We spent most of our time sitting outside on our private patio. I can only say I would recommend it to anyone wanting to explore that part of France. There was an excellent restaurant nearby at Riolas and also in L'isle en Dodon. A supermarket was also handy in L'isle en Dodon too. Thank you so much for terrific review. The sunflowers this year are spectacular. Really sorry to have missed you this year and so glad you liked the new pool. Hope to see you again and hope you arrive safely home. Merci beaucoup Corine pour cet avis excellent! Nous sommes très contents que tout est si bien passé et que vous avez tellement aimé Barès.